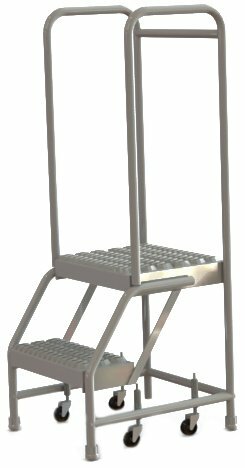 Tri-Arc's 2-Step All-Welded Aluminum Rolling Ladder is made of 3/4-inch schedule 40 aluminum pipe with 1-1/16-inch outside diameter finished in a standard mill finish. This model includes handrails for added safety, spring-loaded casters, Grip Strut tread, 16-inch step width, and 16-inch x 14-inch platform. Ships all-welded. Tri-Arc’s Aluminum Rolling Ladders are engineered and manufactured in compliance with OSHA 1910.29 and ANSI A14.7 standards. Rated capacity of 350 lbs and made in the USA. Base: 19-inch x 24-inch, Platform height: 20-inch, Overall height: 50-inch. 3/4-inch schedule 40 aluminum pipe with 1-1/16-inch O.D. If you have any questions about this product by Tri Arc, contact us by completing and submitting the form below. If you are looking for a specif part number, please include it with your message.